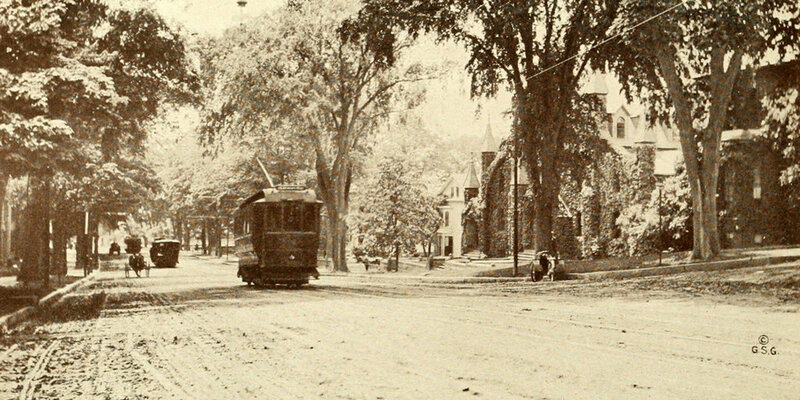 The view looking west on State Street from Myrtle Street in Springfield, around 1913. Image from Progressive Springfield, Massachusetts (1913). The first photo shows roughly the same section of State Street as the one in this post, just taken from the opposite direction. In the early 1900s, the elm-lined State Street was primarily residential, with a number of single-family homes on either side. Also in the photo, on the right, is the ivy-covered facade of the First Baptist Church, which was built in the late 1880s. The congregation merged with another Baptist church around the time the photo was taken, and the building later became St. Paul’s Universalist Church. It was later demolished, and today there is a parking lot on the site. By the early 1900s, the street was still unpaved, but automobiles were still fairly rare anyway. 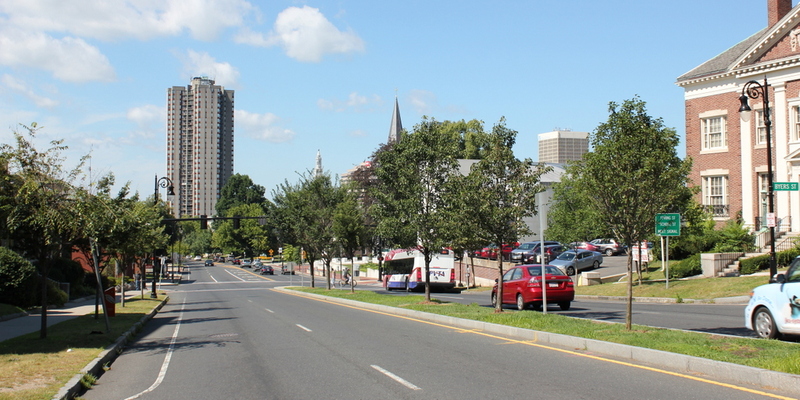 Instead, the trolleys of the Springfield Street Railway carried much of the city’s traffic, and at least three appear to be visible here on the busy State Street corridor. Their days were numbered, though, because within a couple decades most trolley networks around the country had been replaced with buses. In Springfield, these buses eventually came under the control of the Pioneer Valley Transit Authority, and they still operate many lines along this part of State Street, as seen in the 2015 photo.